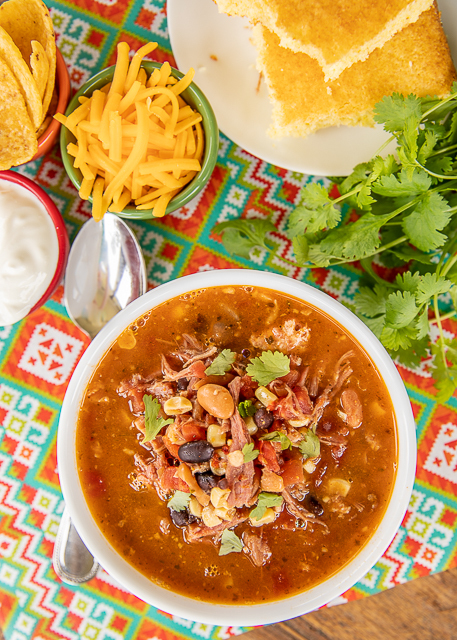 Stop what you are doing and make this Pulled Pork Taco Soup! OMG! It is SOOOOO good!! 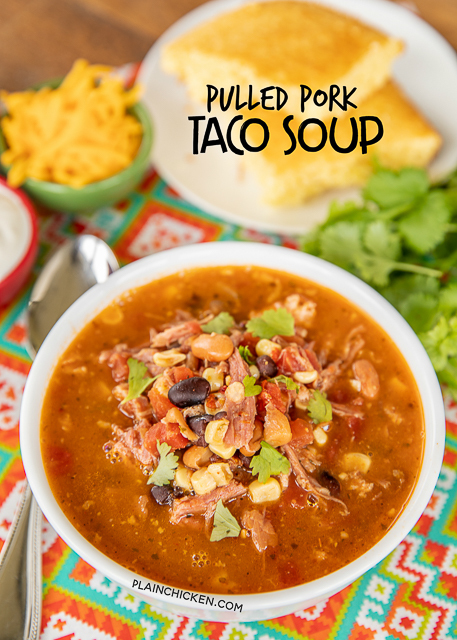 I've made taco soup with ground beef and chicken, but this pulled pork version is my favorite!! WHY haven't I done this before?!?!? 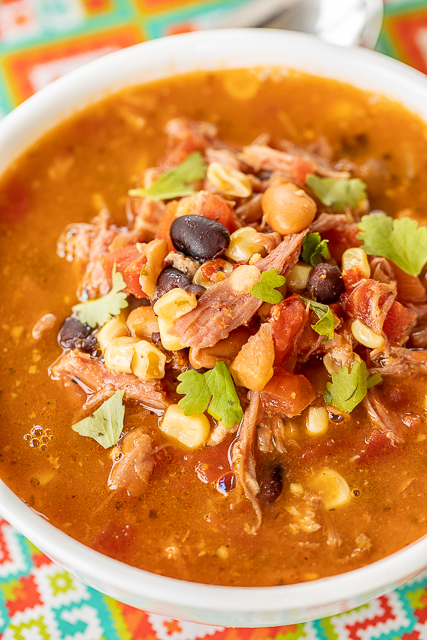 This Pulled Pork Taco Soup takes less than 30 minutes to make from start to finish. Just dump everything in the pot, bring to a boil and simmer for a few minutes. You can make this in the slow cooker if you like. Same thing, just dump everything in the slow cooker and cook on LOW or HIGH for a few hours. I like to whip up a batch in the slow cooker for tailgating and parties. 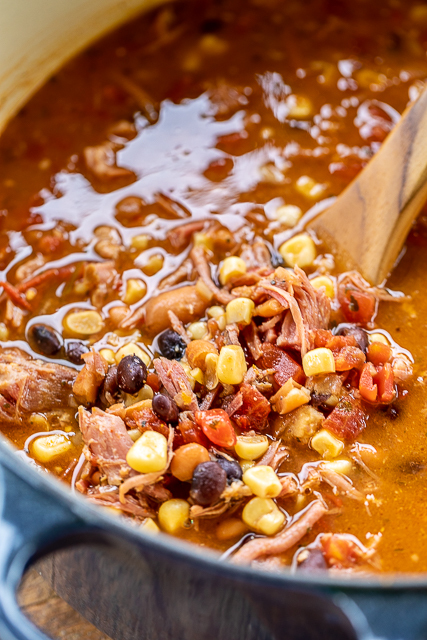 We served this Pulled Pork Taco Soup with some cornbread. Feel free to top your soup with your favorite taco toppings. We like sour cream, cheese and Fritos. SO good!! Just a quick note on the pulled pork. I bought my pulled pork at Costco. You can also find precooked pulled pork at the grocery store or you can go to your favorite BBQ joint and grab a pound of pork for this recipe. 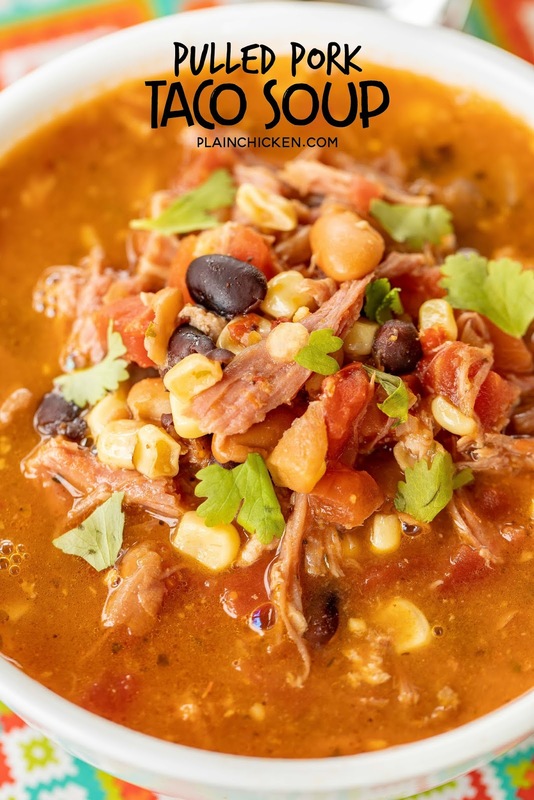 In a Dutch Oven, combine cooked pulled pork, beans, tomatoes, corn, Ranch mix, taco seasoning and chicken broth. Bring to a boil. Reduce heat and simmer for 20 to 30 minutes. So true! Why is there never any pulled pork in these soups? Can't wait to try it -- great tip on buying the premade meat-- so easy! Is the can of Rotel the only tomatoes in this soup? It looks very tomato-y to only have one 10 oz can of tomatoes with chilis. Hello, there is no where locally to get pulled pork. What is your pulled pork seasoned with? I can make the pulled pork, then use in this recipe. Thanks! You mention this can be made in the crockpot - Low for 4 hours or is there a better way to do this?